Architectural characteristics of Roman bridges which secured them stability and longevity as well as details revealing human action across the centuries were revealed in the framework of a project where a number of bridges of Roman and Medieval date were studied with the help of a laser scanner and a ground-penetrating radar (GPR). The study was performed by researchers at the University of Vigo (Spain), making use of non-destructive research methods on monuments, as promoted by cultural heritage-related organizations, including UNESCO. Researchers applied light beams and waves on around eighty-five bridges found in NW Spain. As explained in a report from LifeScience website, the GPR comprises an antenna that emits and receives short pulses, a control unit and a computer. The ensemble can be set up in a type of cart, in which the system is installed or in a mobile survey vehicle to collect data along the road of the bridge. “As well as obtaining information like the thickness of the stones inside, the GPR has reported the existence of two hollow arches in this medieval bridge, hidden underground at one of the edges,” Dr. Mercedes Solla, one of the researchers and current professor at the Defence Academy (Marín, Pontevedra), explains. “The information from this system is combined with the information provided by the LiDAR or terrestrial laser scanner, whose beam sweeps over the whole bridge and in a few minutes takes the XYZ coordinates of millions of points of the monument,” says Solla. 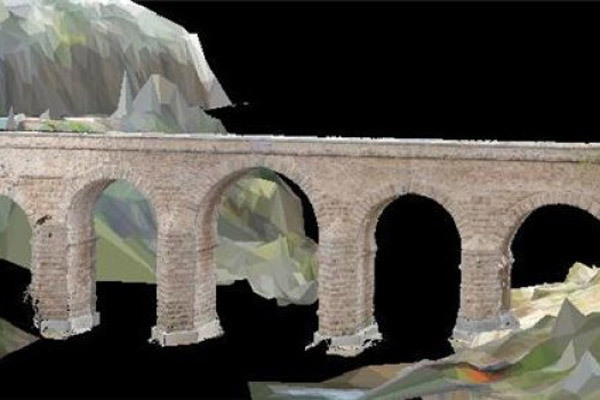 The result is a point cloud, from which detailed plans and 3D models of the bridge can be obtained. Among the finds were hidden arches, cracks, restored spaces as well as later decorative additions, such as a Renaissance engraving on the Roman bridge of Segura, between the municipalities of Piedras Albas (Cáceres, Spain) and Segura (Portugal). In the case of another Roman bridge, in Lugo, states LifeScience, researchers have identified restorations carried out over time, differentiating between areas where granite has been used (the waves of the radar spread faster) and others where schist is present, a material which has a lower conductivity. It has also been detected that the outline of the bridge sloped upwards and downwards during the Middle Ages, although today it is level. The researchers are currently working with a mobile bridge survey vehicle that comprises a mobile 3D laser scanner, a GPR, thermographic cameras and a surface ‘profilometer’. The initiative is part of a European project for the application of technologies for infrastructure management and inspection (known in Spanish as SITEGI). “All this information is of historic interest, but it is also useful to civil engineers so that they can plan conservation, improvement and restoration measures in these types of infrastructures.”, says Solla on the research outcome.